Chicago French Market (131 N. Clinton St., 312-575-0306), located in the West Loop/Fulton River District, opened its newest vendor July 6, Fasta Pasta, adding to nearly 30 individual vendors found at the market. 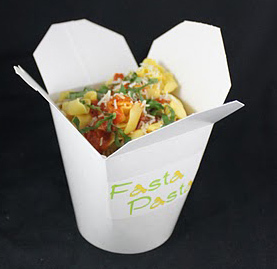 Fasta Pasta, a new, European-inspired fast-casual booth, allows the customers to choose their pasta and sauce from a daily variety. The meal is cooked to order and served fresh in a recyclable container in less than two minutes, perfect for eating right away, or taking back to the office or home. Customers begin by choosing pasta, like Fusilli, Campanelli and Whole Wheat Penne; or choose a premium pasta, from a selection that includes Beef Tortellini, Mushroom Ravioli and Gnocchi. Sauce choices include Marinara and Alfredo; or for a low extra price, premium choices include Vodka, Sweet Red Pepper Basil or Bolognese. Complimentary topping choices include Parmesan and Fresh Basil. For protein lovers, premium additions to the pastas like Meatballs and Chicken are also available. Customers have already been returning to Fasta Pasta to try the many different combinations that enable them to create their “own” special pasta. Chicago French Market is a European-inspired market offering an array of local produce, meats, seafood, breads, pastries, cheese, wine, chocolates, pastas, artisan-made goods, flowers and a seating area for customers. Chicago French Market’s nearly 30 vendors stay open year-round, six days per week, and is located within the new MetraMarket development at 131 N. Clinton St. (between Washington and Randolph Streets). For more information, visit www.chicagofrenchmarket.com.